Understanding the whys and wherefores of a technology goes a long way toward solving your problem. Putting that knowledge to work requires an understanding of the tools of the trade and how to use them. All optical spectrometry techniques rely on the measurement of radiant power. The configuration of the instrument varies based on the measurement technique: absorption, emission, luminescence or scattering. But all of those used in the UV, visible and IR employ essentially the same subcomponents, including sources and detectors of radiant power, light discriminators, optical coupling and steering devices, signal processing electronics, and data analysis and presentation software. The exact combination, their spectral range of operation and the acceptance of performance requirements are very application-specific but often include resolution, sensitivity, detection linearity, speed of acquisition and, of course, cost. The performance characteristics of the optical source in an instrument play a critical role in the acquisition of reliable and meaningful data. The keys are spectral characteristics, wavelength range, temporal and spatial stability, radiant flux and directionality. Sources can be separated into continuum and laser types. Continuum sources such as incandescent lamps and some arc discharge lamps emit over a relatively broad spectral range and are commonly used in spectrometry. One of the most popular lamps is the tungsten filament lamp that operates in the visible and IR spectral region (from 300 nm to the far-IR). These are available in a wide range of electrical powers, source sizes and shapes, and with an operating lifetime often up to 20,000 hours, depending on lamp type and usage. Their low cost and relatively inexpensive power supplies make them ideal sources for many absorption instruments. However, there is little or no spectral output below 300 nm and, in general, there is also a relatively low flux density, especially in the far-IR. The main consideration in the selection of a tungsten lamp is the filament size and its color temperature. The color temperature and the tolerance on the color temperature will determine the spectral peak of the output and also the lamp lifetime (Figure 1). On average, lamp life goes down as the color temperature goes up. A typical tungsten lamp has a color temperature of 2800 °C with a lamp life, operated at rated current and voltage, of 2,000 hours. The same lamp with a color temperature of 3450 °C might have a rated lifetime of only 50 hours. Lamp selection is often a compromise with respect to performance. Figure 1. Lamp output versus color temperature for a tungsten-halogen lamp. Other types of incandescent continuum sources include the Nernst glower, which is an inexpensive but somewhat fragile IR source. Its lifetime, like that of a tungsten lamp, depends on its operating temperature. A more rugged source is the Globar. An electrical current causes the ceramic source to heat and glow at temperatures above 1000 °C. However, cooling is needed at the electrodes, making the Globar more expensive and less convenient. Nevertheless, it offers a better emissivity than the Nernst glower at short wavelengths in the IR. Hydrogen and deuterium arc lamps have a strong emission spectrum in the UV and can be useful from 185 nm (limited by the quartz envelope) into the visible. Shorter wavelength operation is possible by using alternate window materials such as MgF2, which would allow operation down to approximately 110 nm. Deuterium lamps provide a higher optical output compared with hydrogen lamps (Figure 2). They are the primary light source at wavelengths below 400 nm and are well-suited for spectroscopy because they have a relatively small arc size, have a line emission at 656 nm (essentially a built-in spectral calibration point) and have a peak spectral output between 220 and 230 nm. Absorption spectrometers operating in the UV and visible generally use both deuterium (200 to 350 nm) and tungsten lamps (350 to 850 nm). Figure 2. Spectral output curves for (a) deuterium and (b) tungsten-halogen lamps. Photoluminescence instruments require high-intensity continuum sources with UV and visible output. Here, the most common source is the xenon short arc lamp, which has an intense, almost continuous spectral output from the UV (220 nm) to the near-infrared (800 nm) with some fine structure superimposed. Line spectra are prominent in the 800- to 1000-nm range, and optical output can be observed well into the IR (2.6 μm). Xenon lamps have a small arc length (0.5 to 2.7 mm for 75- to 450-W lamps) and a high flux density. They are available in a variety of envelope materials allowing output from 185 nm and have relatively long operating lifetimes of up to 2,000 hours. Xenon lamps typically are operated with DC power supplies, but pulsed versions are available with 1- to 10-μs pulse widths for use in time-resolved measurements such as phosphorescence studies. Xenon lamps offer the highest flux density short of a laser. The spectral output is close to that of the sun at 6000 °C, and they make ideal solar simulators in many experiments. Special considerations when using an arc lamp include envelope materials, ozone dissipation and convection current effects on noise, cooling, arc gap and lamp life. While they are the lamp of choice for most fluorescence instruments, these lamps require a complex power supply with an ignition circuit to strike the arc and a well-designed lamp housing to provide proper lamp cooling. They also are generally more expensive. Line sources are used in many atomic spectrometry applications; the most common are low-pressure arc lamps such as mercury arcs. These lamps have sharp atomic line emission and are excellent sources for wavelength calibration of the spectrometer, especially in the UV. Hollow cathode lamps have become the dominant atomic spectral line source because they can produce extremely narrow atomic lines, typically with widths of 0.01 to 0.02 Å. Electrodeless discharge lamps, where a sealed envelope with a gas/metal salt mixture is placed in an intense RF or microwave field, can produce line radiances some 50 times greater than hollow cathode lamps and, until recently, because of the ready availability of lasers, have found use in atomic fluorescence. Lasers are now the primary excitation source for Raman spectroscopy, but also are widely used in fluorescence and phosphorescence spectroscopy. Lasers produce discrete, narrowband, coherent wavelengths with a sharp directionality, and are available in four main modes of operation: continuous, pulsed, Q-switched and mode-locked. All lasers rely on the ability of the systems to produce a higher number of species in the excited state than in the ground state. Once this population inversion has occurred and the lasing threshold level has been achieved, the laser will operate. Lasers offer a high flux density with high spectral monochromatic purity. n a continuous-wave (CW) laser, the output beam is continuous in time, and the lifetime of the upper level of the lasing transition is longer than that of the lower level. The radiant power from a CW laser is from milliwatts to watts. If the upper level were to have a shorter lifetime than the lower level, then the laser would be self-terminating and could be operated only in a pulsed mode. The output from a pulsed laser occurs as either a single pulse or a train of pulses. The radiant power in a single pulse can be very high, although the average power can be quite low. The characteristics of a pulsed laser are the pulse width, the pulse energy or average power, and the repetition rate. For example, a laser producing a 10-mJ pulse in 5 ns at a repetition rate of 10 Hz has a peak output of 2 MW but an average power of 0.1 W.
In a Q-switched laser, lasing is prohibited until the population inversion has reached a significantly higher value than the threshold value. The cavity is then suddenly switched on, producing a very high intensity pulse. This technique is commonly used with Nd:YAG lasers. With a mode-locked laser, the phase of the oscillating modes are forced to correlate or be locked together. This results in a laser output that has ultrashort pulses, on the order of picoseconds or less, of very high peak power. • Gas: The most common in this group are argon, helium-neon, krypton, helium-cadmium, carbon dioxide and carbon monoxide. Excimers are a special category of gas lasers. Today the most common laser used in Raman spectroscopy is still the gas laser, although use of the diode laser is increasing. • Diode: These offer a compact monochromatic light source. The primary wavelength of diode lasers is in the red end of the spectrum, and there are many CW and pulsed systems available. • Solid state: Examples are Nd:YAG and Nd:YLF lasers. If output power is sufficiently high, they can be used to pump an optical parametric oscillator (OPO), which can produce a wavelength-tunable output from visible to infrared. • Dye: These offer some flexibility in wavelength tuning at a cost in power. OPOs are replacing dye lasers in many applications. Many specialized sources are available for specific tests: xenon flashlamps, used in the study of phosphorescence; hydrogen or nitrogen pulsed lamps, used in the study of fluorescence lifetimes; and light-emitting diodes (LEDs), used as a light source for many applications. All of the optical spectroscopy techniques require either a means to deliver a particular wavelength to the sample, a means to analyze light from a sample, or both delivery and analysis of a particular wavelength. Sorting out this information is a major task in the spectrochemical measurement. Particularly important is the separation of the “true” analyte signal from all of the potentially interfering ones. This process is, in most cases, based on wavelength discrimination, but there are many other methods that can be used to increase the selectivity of the measurement, including the use of time-resolved techniques, polarization and position sensitivity. Wavelength discrimination can be accomplished by dispersive or nondispersive means. Monochromators and spectrographs are the most widely used dispersive instruments. They consist of a dispersive element, such as a prism or diffraction grating, and image transfer optics, which separate a small wavelength from a polychromatic source. Detectors for monochromators are usually single-channel large-area devices. Spectrographs use a fixed grating geometry to monitor a spectral range dispersed over a linear array that is made up of multiple detector elements. The manufacture of commercially available prism-based monochromators is on the decline. Grating-based monochromators and spectrographs, however, are available in a wide range of configurations for applications in the 10-nm to 20-µm range. Figure 3. The Czerny-Turner is one of the most common monochromator configurations. A diffraction grating is a plane or concave element with closely spaced grooves. The grating acts as a multislit source when illuminated by collimated radiation. Different wavelengths are diffracted and constructively interfere at different angles. Most modern spectrometers use reflection gratings with groove densities from 75 to 3600 grooves per millimeter, depending on the spectral range and resolution required. Grating types are separated by their method of production — ruled or holographic. Ruled gratings are made by replicating a master grating prepared by a high-precision ruling engine. Holographic gratings are made by projecting an interference pattern onto a photoresist plate, developing this to produce the pattern. Holographic gratings have essentially perfect groove patterns, almost perfect elimination of false lines or ghosts, and significantly improved stray light rejection compared with ruled gratings. One of the most common configurations of a monochromator is the Czerny-Turner configuration (Figure 3). Many other designs are available but most follow the same operating principle. The incident light is passed through the entrance slit and hits a collimating mirror that produces a parallel polychromatic light beam onto the diffraction grating. The grating spatially separates the spectrum in the incident light and this diffracted light is focused onto the exit slit using the focusing mirror. Each wavelength is incident upon the exit plane at a specific angle and, by rotating the grating position, one can scan these wavelengths across the exit slit and discriminate between each wavelength. The grating equation specifies the angle required to bring each wavelength through the exit slit (Figure 4). where k is the diffraction order, n the grating groove density and λ the vacuum wavelength in nanometers. The slits play an important role in determining the spectral resolution and throughput of the monochromator. In most cases, the slits are adjustable and can vary from a few microns to several millimeters in width. Generally the exit and entrance slits are set to the same width. Several characteristics are important in a monochromator, such as the linear dispersion, f number of solid angle, resolution, stray light rejection and throughput factors. • The linear dispersion is how far apart spatially two wavelengths are in the focal plane, DL = dx/dλ. The more commonly quoted figure is the reciprocal linear dispersion, RD = DL–1 = dλ/dx and represents the wavelength range within a unit distance in the focal plane. • The spectral bandpass is the half-width of the wavelengths passed across the exit slit. The bandpass is controlled by the dispersion of the monochromator except at very small slit widths where diffraction effects and aberrations need to be considered. Thus, the spectral bandpass for a given slit width, W, is Sλ = RDW. • The resolution of the monochromator is closely related to the spectral dispersion. The dispersion governs how far apart two wavelengths are, while the resolution specifies whether the separation can be distinguished. The Rayleigh criterion states that two wavelengths, λ1 and λ2, are resolved if the central maximum of one line falls on a diffraction minimum of the other (Figure 5). Thus, the spectral resolution can be defined by Δλ = /DaW where is the average wavelength between the two lines and Da the angular dispersion of the system. Figure 5. Rayleigh criterion for resolution of two peaks. • Stray light is any radiation passed by the monochromator that is outside the selected spectral position and bandpass. In many cases, the specification of stray light is made by reference to the relative amount of radiation being passed at a spectral position defined as an integer number of bandpass values from the test source — often a laser line. For example, a typical measurement involves filling the grating of a monochromator. Then, an intensity measurement is made both at the wavelength of the laser and at another wavelength eight band-passes away from the laser wavelength. The ratio of the latter to the former is considered the stray light of the system under this criterion. Typically, stray light is very difficult to measure, as it strongly depends upon the wavelength, bandpass used and the type of source. • Bandpass filters of the interference type – The bandpass wavelength and the width of the bandpass define them. It is common to use such filters to select a wavelength; i.e., excitation wavelength for fluorescence, and a different filter for detection of an emission wavelength. Typical values for bandpass are 10 to 50 nm. Filters can offer excellent out-of-bandpass rejection, but do not offer the flexibility of a spectrometer. • Cut-on and cut-off filters – absorb all radiation at wavelengths either shorter or longer than the transition wavelength. The cut-off wavelength is defined as the spectral position where 50 percent of the maximum transmission of the filter is observed. • Neutral density (ND) filters – are virtually wavelength-independent in the 180 nm to 2.5 μm spectral range. They transmit a specific percentage of the incident light; the exact transmission percentage can be very precise to allow strong signals to be measured on detectors that would otherwise be saturated. Use of ND filters enables greater dynamic range in a measurement system. Other nondispersive instruments such as interferometers are often used, especially in the infrared. They can have an advantage in terms of signal-to-noise compared with dispersive spectrometers, especially since in this region the radiation detectors are noisy. Fourier transform techniques are now the method of choice in this spectral region because the instruments have no entrance slits and, after collimation, the effective solid angle can be significantly larger than for a conventional spectrometer. A radiation detector converts the radiant power in the measurement to an electrical signal that can be processed, recorded and displayed. Detectors have the widest range of performance and cost of all the subcomponents of an optical spectroscopy system. Their cost can range from less than $10 for a single silicon detector to more than $40,000 for an intensified charge-coupled device (CCD) array. The detector choice is dependent on the performance needs and size restrictions of the system. There are three main detector categories: photon, thermal and multichannel. Photon detectors respond to the arrival rates of the photons and have a spectral response that changes with wavelength rather than responding to photon energies like a thermal detector, which has a nearly uniform wavelength response. The performance criteria of all detectors include: spectral range, single element or array, required detector area, acceptable signal-to-noise ratio and dynamic range. The largest item driving cost is the signal-to-noise requirement. A wide selection of detectors are available from a host of companies. 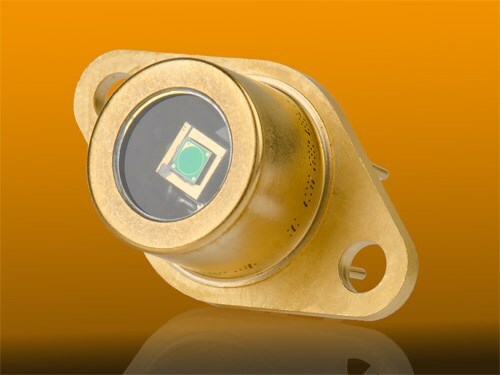 There are thousands of photomultiplier tube types, array detectors (line and 2D array), and semiconductor light sensors and thermal infrared detectors covering a spectral range from 150 nm to more than 40 μm. The wavelength range often determines the detector choice. Visible spectroscopy has the advantage of having the largest selection of detector choices with the highest sensitivity and easiest operation. The number of infrared detector choices at 10 μm is limited. The infrared detector may also require cryogenic cooling with possible operating temperatures of 4 to 77 K.
The responsivity of a detector is the ratio of the output signal level to the incident radiant power, while the sensitivity of a detector is the rate of change of signal output with respect to changes in the incident radiant power. For all photon detectors and many thermal detectors, both the responsivity and sensitivity of the detector are wavelength-dependent properties and, hence, define the spectral response of the detector. The sensitivity of the detector may also change with other variables such as temperature, applied bias voltage and other components in the signal processing circuit. Some detectors, for example photomultiplier tubes, can have different output modes — as a charge or current (analog mode) or as a pulse rate (photon counting). Thus, care must be taken not only in the detector choice, but also in how it is going to be used. Optical detectors can vary widely in their speed of response and in their ability to record quickly changing signals. The rise time of the detector can be important for many applications and can vary from <1 ns to seconds, depending on detector type. In the absence of any input optical signal, a detector will still produce an output, which is the dark signal. The characteristics of this signal vary greatly with detector type and mode of operation. Care must be taken to understand the noise and possible drifts in the signal that might be present before subtracting this signal from one in the presence of the optical signal of interest. The main photon detectors used in commercial spectrometer systems are based on either photomultiplier or photodiode devices. A photomultiplier is a vacuum device with a photocathode that converts an absorbed photon to an emitted electron. This electron is drawn toward an electron multiplier stage. The multiplier gain is dependent upon the number of stages in the photomultiplier (dynode stages) where secondary electrons are released. The signal is collected at the anode and output as a current pulse lasting a few nanoseconds. Typical photomultiplier gains are in the range 104 to 107 where single photon sensitivity is possible. The absorbing surface of the photomultiplier, its photocathode material, defines the spectral range and quantum efficiency of the detector. Photocathodes that respond to longer wavelengths have lower work functions and are therefore more susceptible to noise signals from thermally generated electrons. Thus, if working above 650 nm in photon-counting mode, it may be necessary to cool the detector to –20 °C or less in a suitable housing. Photodiode detectors are based upon the absorption of a photon in a PN-junction diode and the creation of an electron-hole pair in the depletion layer by promotion of electrons across the valence band to the conduction band. The spectral response of silicon photodiodes extends from the UV to the near-IR (1.1 μm). The responsivity of photodiodes is often much less than that of photomultipliers because they have no internal gain. However, they are rugged, exhibit excellent linearity over seven decades of incident radiant power, and can be small in size with excellent time responses. Indeed, some photodiode configurations can have subnanosecond response time. Where high sensitivity and high-speed response are required, one can use an avalanche photodiode, which is operated in the reverse breakdown region of the PN junction. Semiconductor materials can also be used in photoconductive mode where the absorption of light decreases the resistance of the detector following creation of an electron-hole pair. Such detectors are now mainly used in the infrared — examples include PbS, PbSe, InAs, HgCdTe and PbSnTe. PbS detectors are still among the most sensitive uncooled detectors in the 1.3 to 3 μm range. Multichannel detectors have become increasingly popular, especially two-dimensional CCD detectors. With the advent of flat-field spectrographs, the high performance of CCDs can be readily exploited for spectroscopy. A wide variety of detector sizes and configurations are possible including front- and back-illuminated devices with optimization for UV or NIR regions. CCD detectors are good detectors for spectroscopy, as they exhibit excellent sensitivity, linearity, wide spectral coverage and high dynamic range. They have a signal throughput advantage since a wide spectral range can be measured at one time compared with a scanning single-element spectrometer system. The standard-format CCD detector is front-illuminated where the polysilicon electrodes are deposited in front of the detector surface. As a result, all incident photons must pass through these electrodes before reaching the photosensitive layer. The optical transmission of polysilicon decreases below 500 nm, so these detectors do not respond well in the UV. However, they are the most cost-effective detector in the CCD family. With a peak quantum efficiency near 700 nm and a spectral coverage from 400 to 1100 nm, front-illuminated CCDs make ideal detectors in the visible and IR regions. They find application in photometric measurements and Raman spectroscopy with visible laser excitation. If operation in the UV is of importance to the measurement, a thin UV-sensitive phosphor called lumigen can be deposited directly onto the array. When excited with UV light, this phosphor emits photons at about 550 nm that the CCD can easily detect. Typical quantum efficiencies of the lumigen-coated CCD from 200 to 400 nm are 10 to 15 percent. Lumigen has the advantage of being transparent in the visible spectrum, so the quantum efficiency in this region is unaffected by the coating. Etching away part of the polysilicon electrode to expose the underlying detector can also enhance the UV response of front-illuminated CCDs. Such open electrode CCDs have quantum efficiencies of 30 percent in the UV in addition to an enhanced visible and NIR response. This enhanced NIR response is also achieved without interference fringe effects, called etaloning, which are sometimes observed in back-illuminated devices. Back-illuminated CCDs offer dramatically higher quantum efficiency compared with front-illuminated devices because the detector is turned around and the incident photons are directly absorbed in the detector without having to pass through the electrode. For UV operation, these detectors can be thinned to 10 to 15 μm, which minimizes the chance of a photogenerated electron-hole pair recombining before it reaches the potential well of the detector. 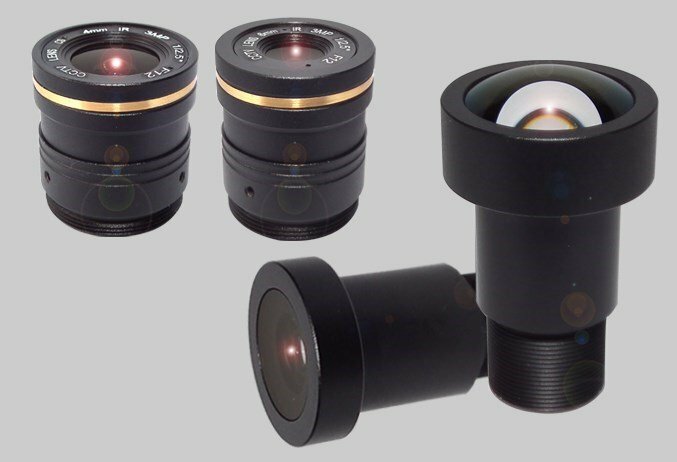 With the appropriate antireflection coatings, the back-illuminated CCD detector can be optimized for the UV, blue, visible or NIR. The quantum efficiency of back-illuminated (also called back-thinned) CCDs can be as high as 90 percent; thus, nearly all the photons are detected! However, in the 700 to 950 nm range, back-illuminated devices may exhibit interference fringes superimposed on their spectral response because of etaloning within the polished silicon. This is a direct result of the thinning process used in such devices and is well-known for these CCDs. For use specifically in the NIR, a CCD can be made with a much thicker than normal silicon substrate to increase the IR absorption depth and collect more NIR photons. These deep depleted CCDs have high IR quantum efficiencies, but also have a slightly higher dark signal because of the deeper wells and altered substrate of the detector. An optical spectrometer relies on optics to image the radiant energy of the experiment from the source onto the sample and the resulting radiant power from the sample onto the entrance slit of the analyzing monochromator or spectrograph. Lenses and mirrors are the most frequently used optics, with optical fibers now playing an increasingly important role. The choice of component is dictated by spectral range and cost requirements. For lenses, the spectral range will determine the material and thus the cost. There are thousands of transmission materials to choose from for lenses. Glass (BK 7) and quartz (of fused silica) make up the bulk of lenses used in the 190 nm to nearly 3 μm range. The choice of material decreases above 3 μm. Some of the possibilities include calcium fluoride (150 nm to 8 μm), zinc sulfide (400 nm to 12 μm) and zinc selenide (600 nm to 20 μm). Beyond 20 μm and below 180 nm, reflective optics are more the norm. Aside from the shape of a mirror, the coating is the most important parameter for a mirror. Overcoated gold and platinum mirrors are available for the VUV wavelength range (10 to 180 nm). These coatings are very costly and difficult to produce. Most mirrors are coated with aluminum or gold. Aluminum-coated mirrors may also be overcoated with MgF2 or SiO2 to prevent oxidation. The reflectance range between these two materials is 150 nm to more than 50 μm. These coatings are very durable and nonhygroscopic. Glass is the main substrate because of its ease of fabrication, rigidity and low thermal expansion; other materials include nickel, brass and aluminum. Fiber optics are being used more frequently in instrument designs for sample delivery and sample collection. Fibers are used in the 200 nm to 3 µm range. A limited selection of fiber materials with different acceptance, numerical apertures and diameters are available. These can be single fibers or arranged in bundles, depending on the application. The output signal from the detector must be monitored, stored and analyzed to make a spectroscopic measurement. As such, the signal-processing and readout system is extremely important to the overall performance of the system. The particular type of signal processing depends on the form of the output signal, the noise sources expected and the signal level itself. The signal-processing step can perform many conversions such as current-to-voltage, analog-to-digital conversion, amplification, or some mathematical operation designed to improve the measurement of signal-to-noise ratio. The outputs of most detectors are used in the analog mode. The exception to this is the photomultiplier, which may be used in the photon-counting mode. Nearly all measurements are made by using an analog-to-digital converter to convert the output of a detector to the digital domain for future processing, analysis and display. Even in digital measurements some conditioning, such as filtering or amplifying the analog signal, is usually necessary to make it suitable for recording by the converter. In photon counting systems, the recorded signal is the number of pulses observed or counted. Photon counting is particularly useful in applications where the signal irradiance is relatively low, such as Raman spectroscopy and some photoluminescence measurements. In the infrared, the use of a mechanical chopper and a lock-in amplifier can be very effective. These allow the signal processing system to measure alternately the optical and dark noise signals and subtract the dark noise automatically. There can be significant advantages to the measured signal-to-noise ratio and signal stability by using such a technique. In fact, the use of such a synchronous demodulation system can literally recover signals that would otherwise be buried in the noise. Lock-in amplifiers cannot be used with transient signals or signals with very high repetition rates. If a signal is repetitive, particularly those from pulsed experiments, then a boxcar integrator can be an effective data acquisition tool. The boxcar integrator allows the measurement of signals related to a trigger event and the rejection of all others. Lock-in amplifiers and boxcar integrators provide analog processing of the signal. Such methodologies can also be implemented in the digital domain using either hardware or software techniques. Photon-counting systems can be constructed where a digital lock-in approach is used. Thus, during the irradiated cycle the counter counts up and, during the dark cycle, counts down to remove the background signal. At the most basic level, spectroscopic software must allow for reliable, efficient collection and storage of data with minimal sacrifice to hardware performance. As spectroscopy increases in complexity and importance in everyday activities, software is becoming more important. Today, software often needs to be sufficiently flexible to adapt to varied applications, yet simple enough for the increasing number of users with limited spectroscopic backgrounds. More sophisticated software packages provide the user with several options in data display and analysis. It is the successful combination of the light sources, light discriminators, coupling optics, and sampling and detection methods that provide an optimal system. This hardware package, coupled with a complete robust software analysis package, is the path to a successful product.